created by the talented Simon Jebenstreit. Reveal of the 3D character coming soon! 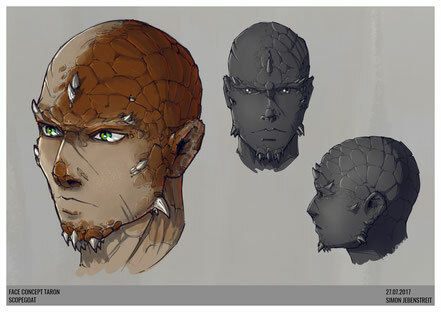 The lowborn mutant Taron, often nicknamed "Firetongue", is the protagonist of our story. Over the course of the game, he learns to use the power of the dragon that was bestowed upon him by yet unknown forces. In his dragon form, Taron is able to freely travel across the continent of Calandhor and the various islands in the Southern Sea. Mighty dragon abilities such as firebreath and fireballs aid him in combat against a variety of flying enemies. In his human form, Taron can interact with other humans, Ronan and Goblins, solve quests, trade, and explore areas unfit for the dragon. © Scopegoat Interactive 2019. All rights reserved.